Wrinkle relaxing injections (Botulinum Toxin Type A) more commonly known as Botox® (a brand name for Botulinum Toxin) is a prescription only medication (POM). 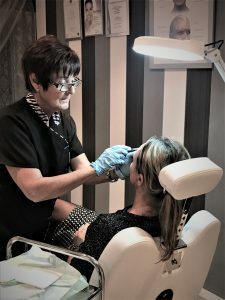 Therefore, a thorough face to face consultation with a registered prescriber will be necessary to determine whether or not Botox® or any other brand of Botulinum Toxin A is a suitable treatment option for an individuals use. There are numerous different brands of Botulinum Toxin A (Botox®, Azzalure®, Dysport®, Vistabel® and Xeomin®) The manufacturers of Botulinum Toxin A products, give strict guidelines on the dilution rates of the powdered contents of a vial, and state that only physicians with appropriate qualifications and expertise in this treatment and having the required equipment should administer their products. Botulinum Toxin A acts at the junction between the nerves and muscle to prevent the release of a chemical messenger called acetylcholine from the nerve endings. This prevents muscles from contracting. The muscle relaxation is temporary and gradually wears off. Some people are distressed when lines appear on their face. Botulinum Toxin A can be used in adults over 18 years and under 65 years to temporarily improve the appearance of any moderate to severe glabellar lines (the vertical frown lines between the eyebrows) and lateral canthal lines (crow’s feet lines). Some Botulinum Toxin A products are only licensed to treat the glabellar area. Please contact us for more information on Botox Blackpool, prices and monthly offers.